I love Maggie Stiefvater and I loved the Shiver series, so I'm really excited for this spin off. 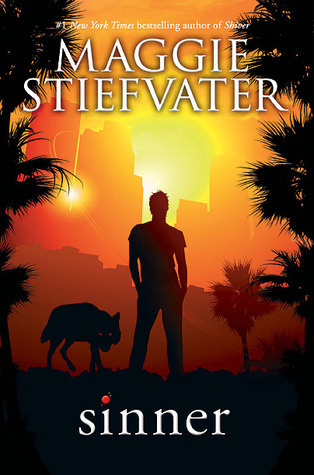 Author Maggie Stiefvater says, "For me, finishing the Shiver trilogy was a bittersweet moment -- I knew that I wouldn't be returning to Mercy Falls once Sam and Grace's story was over. But Cole and Isabel still lurked in the back of my mind. Both of them were only half-fixed at the end of the trilogy, and I wanted to know if they could be fixed the rest of the way." WANT WANT WANT. So excited for this, though I wish they would've kept the theme from the Wolves of Mercy Falls covers. And I hope we see Sam and Grace! I never finished the Shiver series but this sounds really good :) Nice pick! Yay! I'm so excited for this! Cole was one of my favorite characters in the series so I'd like to check out his story! This is one of my highly anticipated reads as well! YES! I can not wait for this one either. I'm going to pre-order it. Love to see Cole and Isabel back. Maybe we can get a hint of Sam and Grace too? I'm also really looking forward to this one. Also...infinite cover swoonage right now! I love this series, and am really excited for it to continue. Great choice! Oh I am soooooo looking forward to this one! I must admit I haven't even read the last book in the series;( But I remember Cole and ... I'm so excited for this book! I NEED THIS. Cole was my favorite part about that last book, and I can't wait to read more. I am also very excited for this spin-off! I really loved the Shiver series and Cole was one of my favorite characters, so I can't wait to hear his story! Thanks for sharing! AHH! Yes, I love to read this one as well. I loved the Shiver series so much I am SUPER excited for this one! Glad to know I have other friends out there that are excited about it too! I’m happy I gave Sinner a try. There’s a lot of angst, swoony moments, a little bit of wolf and awesome new characters that will make your heart melt, I’m looking at you adorable Leon! If you love Maggie, then you’ll love this book.